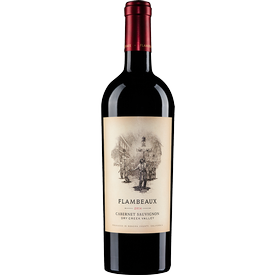 Tasting Notes The 2015 Flambeaux Dry Creek Valley Cabernet Sauvignon is vibrant with aromas of red currants, dried cherries, cedarbox and madagascar vanilla. The palate is nicely structured with fine tannins, black tea, toasty spice and a chocolate covered cherries. There is a silkiness and bright fruit that is refreshing in this wine. It should endure for years to come. Vineyard Profile The Flambeaux Vineyard in Dry Creek Valley is located in the sweet spot for vineyard elevation – about 350 ft above the valley floor. The soils are the Boomer Loam series which is a Metamorphic soil and our particular area has the redder, more iron rich soils. This soil type is especially good with Cabernet Sauvignon grapevines and leads to great minerality and natural acidity. The rolling hillside provides great drainage and being up the hill from the valley allows the vineyard to stay a bit warmer – perfect for ripening Cabernet Sauvignon. Winemaker Notes The grapes were picked at dawn in a cool fog and were brought immediately to the winery. There, the grapes were sorted, destemmed, then the berries were sorted again before being put into the small stainless steel tanks for fermentation. The grapes were cold soaked for 5 days before fermentation to allow for some natural color and phenolic extraction. The wine was then fermented and allowed to sit on the skins post fermentation for two weeks. They were then pressed and put into barrel where they underwent Malolactic Fermentation. Post ML, they were gently racked off of their heavy lees and put back in barrels where they sat in the cellar to age for the better part of two years. About Flambeaux Wine Flambeaux are the dancing torchbearers of Carnival night parades. A quintessential symbol of New Orleans traditions, Flambeaux represent all that we love best about wine—light flickering in a glass, complex flavors dancing across the palate, and a celebration of life.